Publisher: Publications International, Ltd., 2004. Hard Cover, 94 pages, 8.5 x 11. Beer isn't just for drinking anymore! Enjoy the bold and hearty flavors this frothy brew lends to soups, sauces, bastes and breads. 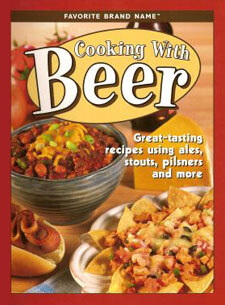 Chock-full of more than fifty mouthwatering recipes, Cooking With Beer has all you need to kick up any occassion-from game-day parties to delicious and easy weeknight dinners.